I’ve had a few ideas bouncing around my noggin for a while that have finally made it to a finished piece. I’m revisiting an old theme in a whimsical new way. When I’m trying out a new design motif I love to “sketch” it out on a sauce bowl. It is such a great way to test out the design on the shape of a pot, and surface of the clay, in miniature form. I’ve wanted to sign up for the sew a skirt class at Crafty Planet for over a year now. It seems like there is always a conflict – not this time – and they had just one space left, yeah! The class starts this Sunday and I couldn’t be more excited! The new pots are timely aren’t they?! My first sale of the season, the Minnesota Knitter’s Guild Yarnover, is coming up and I’m going to make some more along this theme to have at the event. In the meantime these are available on my etsy site. This entry was posted in Uncategorized on April 11, 2007 by Jennie. Love the sewing theme!!! Quilting anyone? Thanks for your interest. I’m in the process of redesigning how I do business. Instead of making pots to order I will be making pots and selling what I have when I have them made. These “updates” will happen as I have enough pots available to do so. 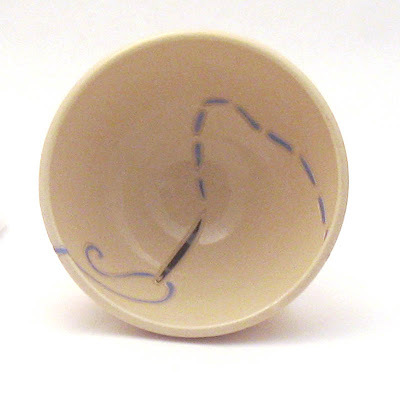 Rest assured I will have some “special yarn bowls” available for purchase with the first update! I encourage you to join my mailing list and that way you’ll be amongst the first to know when the work will be available for sale!